What Will Become Of The Cuming Museum? Scott Wood What Will Become Of The Cuming Museum? 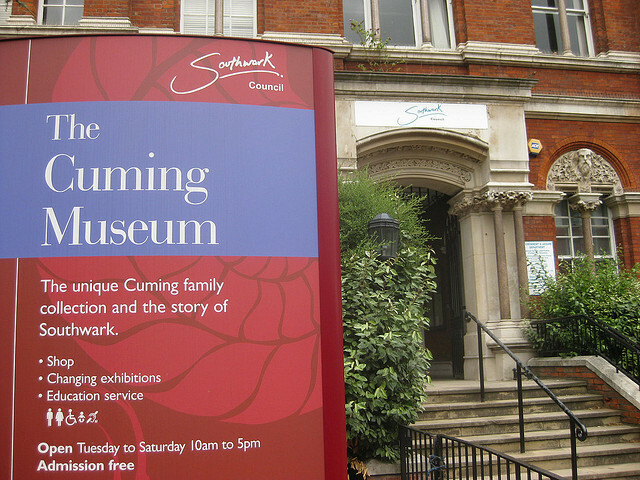 The Cuming Museum was a fine repository of local and international artefacts based mainly on the collections of Richard and Henry Cuming, and included a trove of London charms and talismans. The museum was a much-loved, quirky guide to the lives of ordinary Londoners which included magical objects, forgeries, archaeology artefacts and historical ephemera. The building was seriously damaged in the fire, and part of the collection was lost. The damaged museum was then burgled, with staff possessions and an ‘ornate Asian tray’ being taken. The fire is thought to have started when a roofer accidental left a blowtorch on. The Cuming Museum will return to the former Walworth Town Hall building when it reopens in a few years. In the meantime we are working closely with colleagues in the libraries, arts and heritage services and developing new projects. Staff continued to share surviving parts of the collection with public after the fire. The Cuming Cabinet of Curiosity brought activities and objects to libraries across Southwark this spring, ran an object of the month page, contributed objects to a Modern Witchcraft exhibition at ASC Gallery on Blackfriars Road, and held a Museum in the Pub event with the South East London Folklore Society (SELFS). The heritage service is currently being reorganised with a number of posts being deleted and new ones being created. Staff involved have a number of options open to them, including an opportunity to take voluntary severance. We will recruit for vacant posts once the reorganisation is complete. On the Elephant & Castle regeneration page regarding Walworth Town Hall, Southwark Council make it clear that they are working with English Heritage to restore the fire-ravaged building as best they can, and that space will be provided for “the Cuming collection and Southwark museum”. In our opinion, the Cuming Museum can't return soon enough.